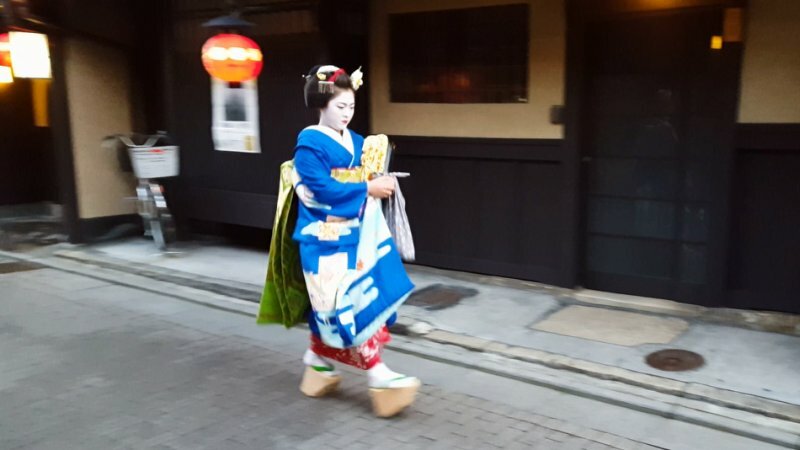 When visiting Kyoto one of the popular things to do is stroll through the streets of the Gion to enjoy the sight of the traditional wooden buildings and watch geisha and maiko making their way to work for the evening. The Gion district was originally developed in the middle ages as a town to accommodate travelers and visitors to the nearby Yasaka Shrine. 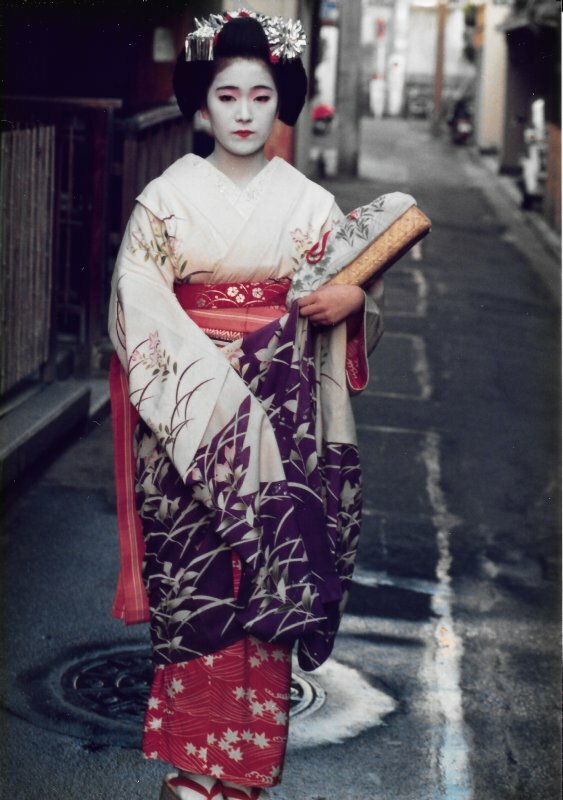 Over the years it evolved to become one of the most exclusive and well-known geisha districts in Japan. 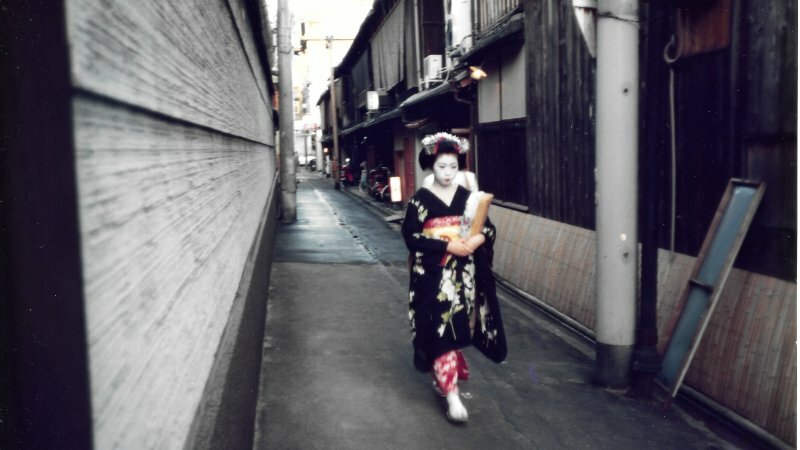 The Gion is one of the best places (if not the best) in Japan to get a glimpse of geisha and maiko. 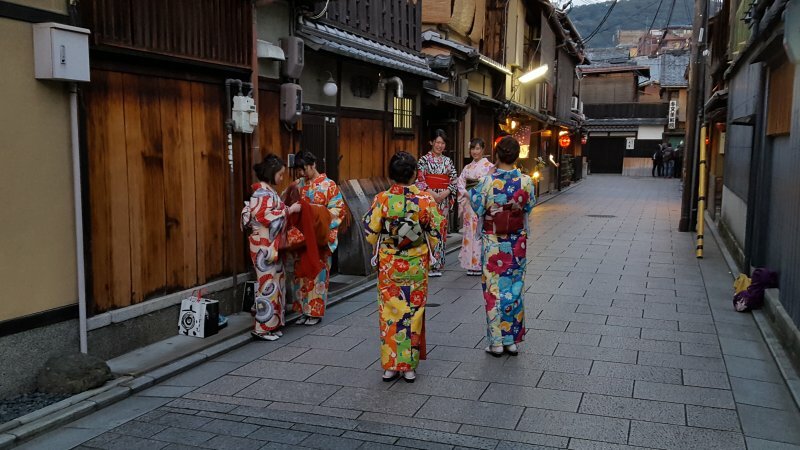 With its traditional wooden buildings it is a great backdrop to the nightly occurrence of geisha and maiko walking the streets on their way to work at the many teahouses and restaurants in the Gion. The area around Hanamikoji Street south of Shijo Street is the best place and early evening is a great time to visit and walk around the area to get a glimpse of geisha (or geiko as they are called in Kyoto) and maiko before they duck into one of the many teahouses and exclusive restaurants to entertain. The easiest way to distinguish the geisha from the maiko (apprentice geisha) are the tall wooden sandals worn by the maiko. The big event in Gion is the Gion Matsuri. Held each summer, the Gion-matsuri festival attracts more than a million visitors. The festival is famous for its procession of magnificent festival floats on which musicians play Gion-bayashi, festival music featuring Japanese flutes, bells and drums. The festival runs from July 1st through the 31st. The Kyoto City Tourism Association provides detailed schedule and information for the event. 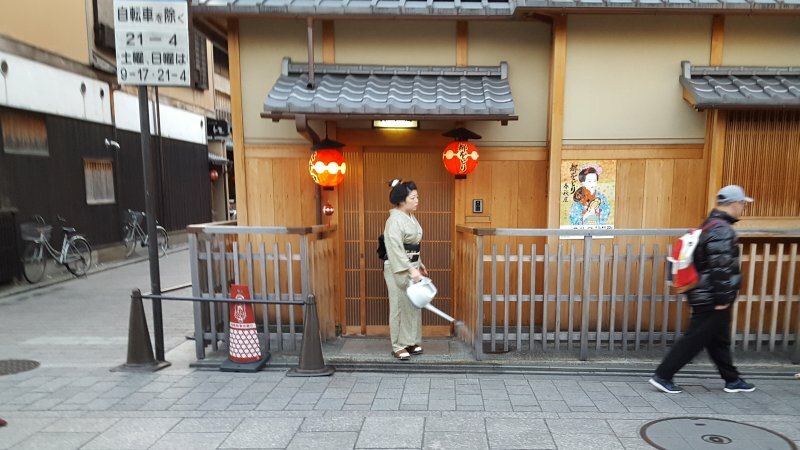 Want to get the full experience of strolling the streets of Kyoto? 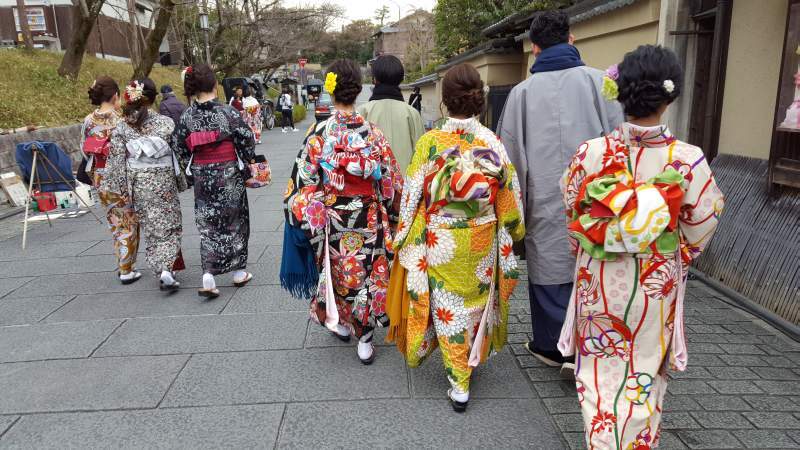 Popular with tourists is to rent a traditional Japanese kimono to wear while enjoying a walk around Kyoto. Particularly on the shopping streets around Kiyomizu-dera temple and Gion you can see many Japanese and foreign tourists in kimono attire. 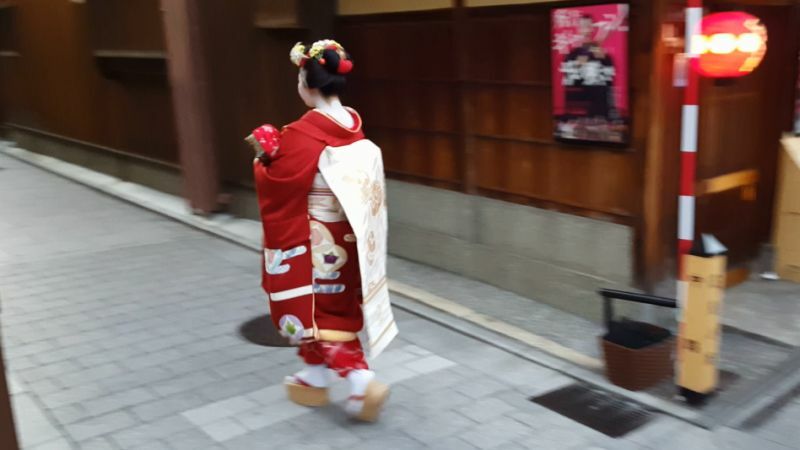 Two of the many places to consider for kimono rental are Yameyakata and Okamoto.